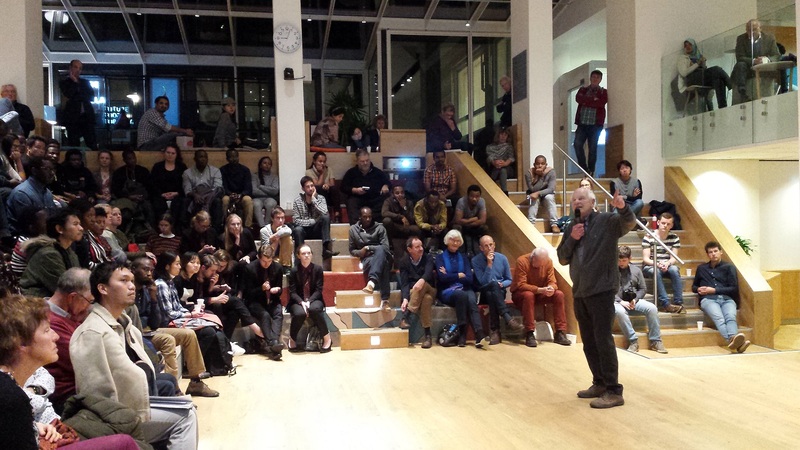 The first lecture of our lecture series took place in a crowded Impulse Building on WUR campus. More than over 100 participant came, including students from Van Hall Larenstein! Gijs den Hertog, senior expert animal husbandry and (co)writer of diverse Agrodoks, gave a realistic presentation, based on his long experience in the sector. There is a future he said, but under two important conditions, water and feed. Pedigree cattle contribute relatively little to output and often are not adapted to difficult terrains. And small-scale farmers often lack information about market and chains. He emphasises that per situation conditions must be analysed to find proper solutions. Afterwards many questions were raised by students, working and studying in the sector. The lecture was organised by Agromisa in cooperation with the student association ‘ De Veetelers ‘, who gave a brief outline of their objectives. This entry was posted in News and tagged Agromisa, lecture, Small-scale animal production, Veetelers.